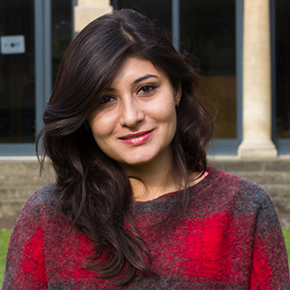 Divya graduated from the National Law Institute University, Bhopal, in 2012 placing first in a cohort of 85 students. Before Somerville, Divya was practising corporate law in India for four years and after completing the BCL, Divya intends to return to India to resume practising as a transactional lawyer. ‘Cornelia Sorabji is a celebrated figure in India. She is a source of inspiration for many young lawyers, including me. Many of my Indian friends and seniors from college have studied in Oxford and a majority of them are from Somerville. I had heard wonderful stories about the College from them and was very excited when I got an offer to study here. I want to go into academia and am hoping that this course will gear me with the requisite knowledge and skills that I need to become a good academic.